People are always surprised at how much I write. They think I am constantly inventing. What they don’t seem to notice, though, is that what I am constantly inventing is myself as a writer. By this I mean it is difficult to pigeonhole me. Am I a picture book writer, a fantasy writer, an historical fiction writer, a poet, a music book writer, a writer of pedagogical books? I used to tell people that I had written everything but cookbooks, sports books, and hard science. And then I wrote FAIRY TALE FEASTS with my daughter, a cookbook based on fairy tales, and MOON BALL about a boy who learns how to finally hit a ball in a dream game with the All Stars who are actual stars. 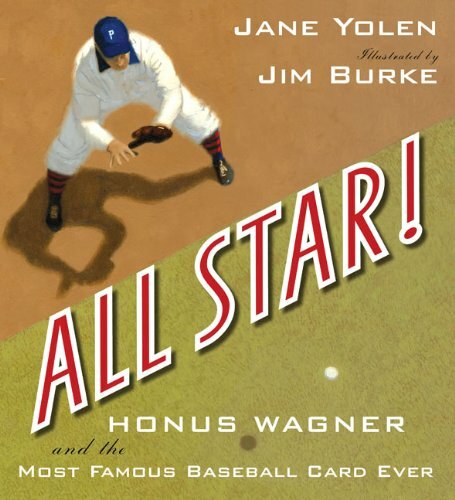 And having broken those barriers once, I am doing it again, writing JEWISH FAIRY TALE FEASTS with my daughter, and ALL STAR: The story of Honus Wagner. But I haven’t written hard science yet, though much of my nonfiction and a lot of my poetry is about natural science. It is the very act of writing lots of different books that have done two very important things to my writing life. The first is that I am never bored, but constantly inspired. And secondly, this has consistently energized a writing life of forty-five plus years. I often say that the reason I write in so many different genres is that I have a low threshold of boredom. And that is an amusing way of telling people that if I really wanted to repeat and repeat myself, I would have taken a job in a factory. At least then I would have been assured of a regular paycheck. I know some authors are comfortable doing the same book or series over and over. Or the same genre. And publishers will tell you—more or less accurately—that this is the way to build a dedicated readership. But it is not for me. I love to try new and difficult things. Learning new things is a way of keeping young. The latest for me is the graphic novel. The learning curve alone was steep, but now I am working on my fourth one and soon it may be time to try something else. An opera? Maybe. A full Broadway musical? Probably not. A major motion picture? Not sure I have the chops for that. But I never ever say never. Now let me walk you through the second—how writing in a dozen or more different genres has kept my writing career alive for over almost half my life. It may be helpful to other writers to know that. As an editor and a writer, I have seen too many really good writers flounder when the genre they love and have been successful in—be it sweet sixteen books or gentle/quiet picture books, kids horror novels or westerns—have died the True Death. Yes, occasionally these genres get resurrected. Fantasy was declared dead a year or two before Harry Potter, by foolish, cynical book folks. Now it rules the YA and middle grade lists. Historical fiction for both children and adults seems to go in seven-to-ten year cycles. Books for boys get pumped up every five years or so. Multicultural, multi-racial books get vitamins shots every now and again. HEATHER HAS TWO MOMMIES began the gay liberation of children’s books though gay authors and illustrators have been the backbone of children’s books for ages, the authors writing bestselling books with no visible out gay content, like WHERE THE WILD THINGS ARE and GEORGE AND MARTHA and GOODNIGHT MOON and HARRIET THE SPY. But when an author is incapable of adapting to the changing faddish genres, when they are flummoxed by new ideas or new delivery systems, when they cannot write in more than one style or other than one type of book, they may have a career that can be measured in mayfly days or against the short vocation of a ballet dancer. Without meaning to, I dodged that bullet from the start. My first five books included a nonfiction book about lady pirates, a rhymed concept picture book, a tongue-in-cheek fairy tale, and a pun-filled picture book about a little witch who could do no magic. Book number five was a realistic novel about a black child from the ghetto sent to spend the summer with a Quaker farm family. Along the way he rescues a horse bound for the glue factory. And as I began, so I have kept on, until in 47 years I have published 300 books. The moral of this tale? Reinventing oneself as a writer is (at least for me) the only way to go. It keeps the brain spinning with fascinating forays into unexplored genres. It means finding new ways to say old things and old ways to say new things. What I lose in dedicated fandom, I more than make up in longevity and introducing my readers to a backlist that they can grow up with, from baby books like MOUSE’S BIRTHDAY and HOW DO DINOSAURS SAY GOODNIGHT, to more sophisticated picture books like OWL MOON and MY UNCLE EMILY to chapter books like WIZARD’S HALL and on to YA books like THE DEVIL’S ARITHMETIC, BRIAR ROSE, GIRL IN A CAGE, and SWORD OF THE RIGHTFUL KING. A reader can even go with me into adult books. And what a time, what a glorious time, I have had writing them all. Every single one of them. Even the ones that haven’t sold yet, and those that may never sell in my lifetime. Because I have grown with the writing; reinvented and reinvigorated my mind, my heart, and kept myself young. Seventy-one years young. . .and still counting. Ah, but you’re getting ahead of yourself. You won’t be 71 for another few weeks! !